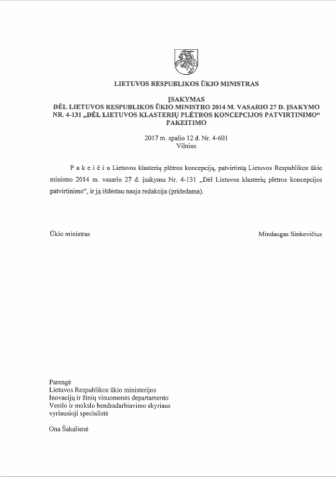 On 12 October 2017 Mindaugas Sinkevičius, the Minister of Economy of the Republic of Lithuania signed an order on the amendment of the concept of the development of Lithuanian clusters, by which the document, appplicable from 27 February 2014 was changed by a revised version. The new wording of the concept of the development of clusters in Lithuania is based on the survey of Lithuanian clusters, in September of 2017 performed by the Public Institution the Research Institute for Changes by the order of the Agency for Science, Innovation and Technologies (MITA) and on the “Lithuanian Clusterization Study“, prepared in October. The new concept was born by the order of 31 May 2017 by the Minister of Economy “On the formation and implementation of the working group for the proposals of Lithuanian cluster policy and the formation of the provision of monitoring and evaluation of clusters“ in the formed working group, consisting of the representatives of the Ministry of Economy, MITA, Lithuanian Innovation Center (LIC), and the Lithuanian Clusters Association. In the approved concept of cluster development in Lithuania of 12 October, both the definition of the cluster itself has been updated according to realias of these days, as well as other cluster-related concepts. The concept presents new clusterization study data and conclusions, and the latest tendencies of the European and global cluster development are summarized. The new concept of cluster development emphasizes the need for international and cross-sectoral cluster development. It is emphasized that it is necessary to create a favorable environment for the development of innovative clusters, international relations and the development of international world-class innovation clusters. The new concept has updated cluster development goals and objectives. It is provided that the aim of the cluster development is to increase the competitiveness of the Lithuanian economy by promoting clusterization and making it more efficient. In order to achieve the intended goal, it is necessary to develop the innovative potential of clusters; to promote the export of cluster members’ products and to join to international value chains; to increase the efficiency of the activity of the cluster members; to form a favorable environment (ecosystem) for the establishment, operation and development of clusters; to promote cross-sectoral, interregional, and international cooperation and to disseminate the benefits and potentials of clustering. The renewed concept retains the requirement for a minimum of 5 members in the cluster, but along with this there is a novelty: 4 levels of cluster development are foreseen and the indicators are described, according to which the cluster is assigned to one of these levels. The clusters will be divided into the emerging, formed, developing, and mature. These levels will be one of the bases for the assessing of Lithuanian clusters, including the EU funding, alloted to them. The new concept of cluster development provides that clusters can be created and developed at the expense of cluster members, the state and municipal budget funds, the EU‘s and other financial support funds. The priority will be given to cluster initiatives, aimed at developing of cluster members’ overall MTEPI activities, introducing innovations, delivering cluster potential abroad and enhancing employees‘ competencies. In accordance with the procedure, agreed with the Ministry of Economy, the monitoring of clusterization will be implemented by the MITA.